Phylogenetic relationships among extant anthropoid primate lineages, including Old World monkeys, apes, and humans. 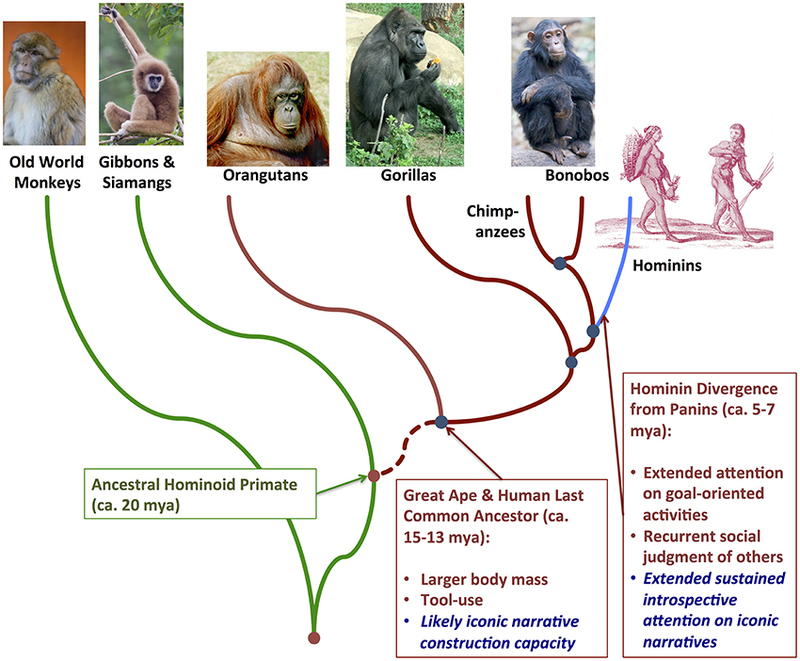 Evolutionarily derived features hypothesized to distinguish embodied niche construction in the nested great ape-hominin and hominin-only clades, respectively, are highlighted in the text boxes lower right. CC-BY 2014. Awareness means slightly different things in different situations. We become aware of a pattern or change in our immediate surroundings, via sensory cognition. We become aware of patterns or changes over time through an interaction among sensory experience, emotional experience, and memory. And we become aware of abstract notions and imagined possibilities through mindful experiences: dreams, sudden awareness of dramatic fears or comic surprises, or learned, disciplined introspection. All of these forms of awareness involve our central nervous systems amping up physiological and cognitive activity in response to (external or internal) stimulus. But we usually don’t think about these diverse awareness processes together … let alone how they might interact with one another to shape more complex, hard-to-grasp phenomena like consciousness. Those interactions among awareness processes are probably VERY SIGNIFICANTLY recursive for us. Awareness of intestinal discomfort or simply heightened awareness gained from greater oxygenation with a faster heartbeat and vasodilation could come from a sudden exciting memory, from an extrasomatic stimulus, or from a learned association between the perceived environmental feature and the constructed memory. In turn, the sustained awareness committed to introspection and decision-making can mediate bodily discomfort or excitement, leading to less agitation and more efficient interaction with the extrasomatic environment in the future. It may also have a cascading effect on associations with anxiety-related memories, altering how we related to our past, how we associate learning with earlier experiences. To be sure, the interactions among awareness processes probably affect what we experience as consciousness. So let’s try to maintain our joint introspective and sensory focus on a couple of questions. How do awareness and introspective attention specifically shape human relationships to our own bodies and our surroundings? How have those complex relationships–that is, those interface environments between mind and the world–shaped the evolution of our capacity to think through stories? Now, even in scientific research, we tend to think about the more immediate, short-term manifestations of awareness as more animal-like–especially those manifestations involving a central nervous response to an extrasomatic stimulus. Clearly, the embodied cognitive feedback system is simpler. The animal has a strong genetic disposition to increase alertness almost instantaneously when it senses certain features of its surroundings, especially related to avoiding predators, finding and capturing food, or courting and engaging in reproductive effort with mates. Or it learns through emotional positive or negative reinforcement to develop associations between sensed environmental patterns and heightened levels of alertness or higher-order cognitive awareness that it’s relevant to pay attention and make a decision (e.g., flee or fight). Yet, it’s also clear that we can seduce ourselves into thinking that the boundary between animal and human cognition is so clear. Especially among birds and mammals, awareness involves memory construction and recall. And certainly among mammals–and possibly among birds–periods of reduced awareness of the surroundings (i.e. sleep) involve dreaming, during which important constructed associations may be simulated in the brain, supporting the learning of contexts in which heightened awareness may be most salient during waking hours. I recently published an article titled “Embodied Niche Construction in the Hominin Lineage” in the online open-access scientific journal Frontiers in Psychology: http://journal.frontiersin.org/Journal/10.3389/fpsyg.2014.00834/full#h1. The article explores the hypothesis that our ecological niche consists in no small part of embodied, iconic narratives that emerge during our earliest years–as we interact with the world. These narratives continue to shape–and are shaped by–our behaviors throughout life. Indeed, I have written on this blog about the importance of dramatic, concise narratives that shape us–and that we, in turn, actively shape. I have written about how these narratives for humans are embodied and enacted in ritualized practices, which involve playful as well as serious departures from the experience of everyday routine and rhythm. In the new Frontiers article I tried to consider the evolutionary and developmental foundations of why we’re so good at “storifying” what happens and what we do. At the most basic level, I’m trying a new, additional tack toward a focus on scientific inquiry that many other researchers have begun to chart out. 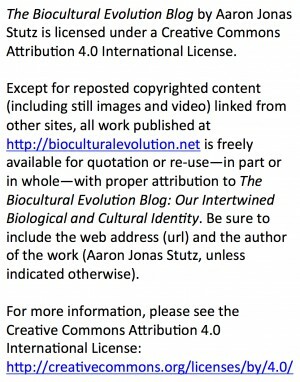 More specifically, colleagues working in psychology, neuroscience, robotics, philosophy of cognition, artificial intelligence, and–credit where credit is due–sociological and cultural anthropological traditions in practice theory have long recognized that the body itself is an environment that shapes our thoughts, actions, and even evolutionary adaptations. 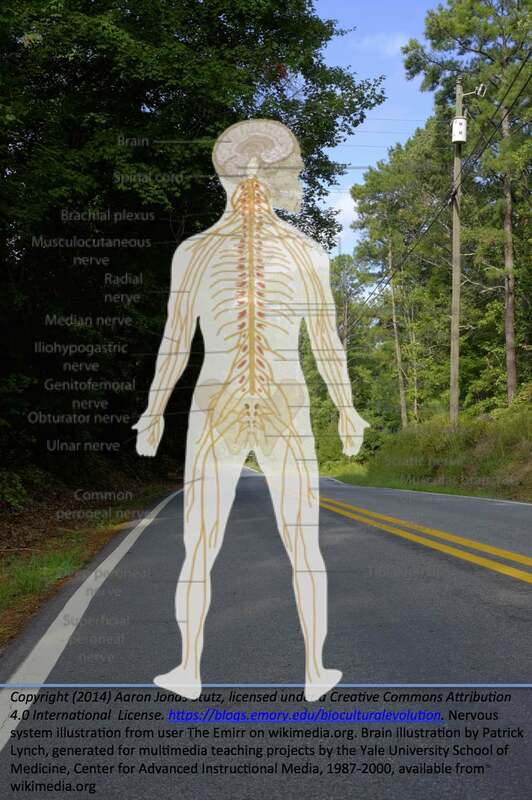 Once we notice how important the somatic environment is, we further recognize that the interface between the body and its surroundings is not only porous; it is also especially dynamic. Where the body ends and the surroundings begin … well, it’s a constant negotiation of mutual influences and interactions. Finally, our complex, dynamic experience of what happens on either side–and across–the somatic/extrasomatic interface may be represented in higher cognitive processes, not just as simulated associations … but as simulated iconic narratives. As the psychologist Lawrence Barsalou has now long argued, neural simulation across the cerebral neocortex–and between the neocortex and more evolutionarily primitive parts of the cerebrum and cerebellum–reinforces cross-model evocation and association of sensory, proprioceptive, and interoceptive stimuli. Our brains not only gather such stimuli, but they put them together associatively into the learned impression and memory of a chair, for instance. Yet, I would suggest that our brains hold together these perceptual concepts by simulating them in the context of heroic or tragic embodied narratives, which may be as simple as simulating the emotional association of successfully or unsuccessfully constructing a coherent aspect of our world. My hypothesis is that human (or hominin, according to most specialists in human evolution and biology) abilities to learn language and share stories with one another depended on an even earlier evolutionary development, dating to as early as 4 million years ago. This development was the emergence of emotional, highly evocative iconic stories–stories that our australopithecine ancestors constructed in their memories and imaginations, inspired from the first weeks of life through old age, in surroundings that were more terrestrial (as opposed to more arboreal, as was the case for the evolutionary ancestor we share with the panins–that is, chimpanzees and bonobos) and intensely social. 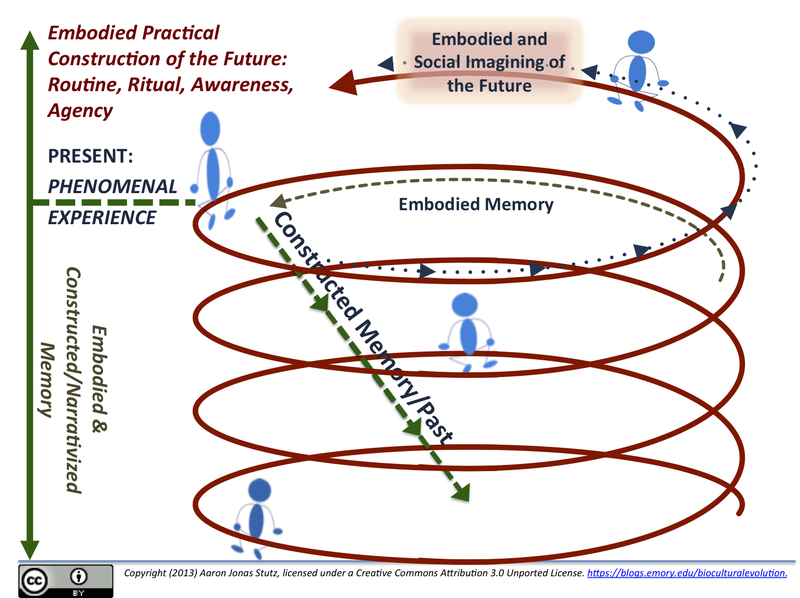 The continuous, real-time nature of experience, thought, and action structures and is structured by socially produced, systemic tangles of symbols and symbolic associations. As each of us is constantly involved in constructing our past and our memories, while also contributing socially to constructing our futures, the continuous symbolic process of social judgment and action can simply make it very hard to create time, space, institutions, and relationships to support reasoned judgment. These stories are so elementary that, today, we don’t even recognize how important they are to experience and behavior. Key iconic, pre-linguistic narratives that shaped early human experience would have been about self achieving–or failing to achieve–social judgment … or making–or failing to make–a behavioral decision in the face of ambiguity. These are really narratives with emotional, genuinely dramatic storylines. Self shapes–or fails to shape–the world, whether in a wholly introspective private place, or in bodily interaction with the surroundings. Before we can tell or understand stories with words, we already create stories without words to construct and manage our embodied way through our surroundings. Frontiers in Psychology is a peer-review open-access journal. The Oxford College of Emory University Faculty Development Committee provided support for the publication, in the form of an award to Dr. Stutz in Fall 2013.